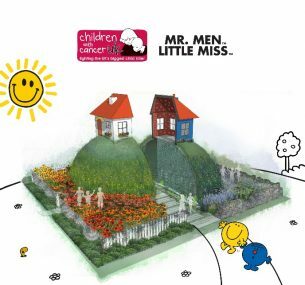 Children with Cancer UK, the nation’s leading charity dedicated to research into childhood cancer, is collaborating with Mr. Men Little Miss to host a show-stopping garden at the Royal Horticultural Society’s largest flower show at Hampton Court Palace on 2-8 July 2018. The garden, ‘The Children with Cancer UK Mr. Happy Mr. Worry Hill’, designed by Reed Studio, celebrates thirty years of the charity’s work in funding scientific research into childhood cancer. Every day, more than 10 families in the UK get the devastating news that their child has cancer. Over 4,000 children and young people are diagnosed with cancer every year in the UK. The aim of the garden is to raise awareness of the crucial role scientific research plays in developing kinder, less-toxic treatments for children to save and improve young lives. The garden’s striking design represents the journey many families and children go through emotionally from diagnosis to treatment. This includes the resilience of families and children affected by cancer as well as the fears, worry and pain they experience. Clinical psychologist Dr Katie Hamilton of Frimley Park Hospital has played an integral part of the design team having worked with children and their families living with cancer. Set within Misterland, the home of the Mr. Men characters, the key theme is a split hill with iconic features from Mr. Men illustrations. One side represents happy and the other worry. Bright shades of yellow and orange symbolise the feelings and emotions of happiness, and the shades of blue and purple symbolise the feelings of worry. On one side a waterfall represents tears, and on the other side a light wall represents hope. Children with Cancer UK is the only charity Diana, Princess of Wales ever inaugurated, having planted a tree in January 1988 in memory of Jean and Paul O’Gorman, who sadly fell victim to cancer within nine months of each other. A garden at Hampton Court was considered a fitting way to mark this occasion in the special 30th anniversary year of Children with Cancer UK. Thirty different species of plants will feature in the garden and flowering turf. Sandstone is the key material, depicting the dry-stone walls used in the Mr. Men books as well as the vernacular of the West Yorkshire landscape where Mr. Men author Roger Hargreaves was born. “The Children with Cancer UK Mr. Happy Mr. Worry Hill is a fitting way to celebrate our 30th anniversary. Children with Cancer UK raise and invest money for vital specialist research to help save the lives of children with cancer and keep their family together. “The garden represents the immense progress made in childhood cancer treatment over the past thirty years since the charity was established, but also how much more work there is to do. The garden will be on display at the 2018 RHS Hampton Court Palace Flower Show, 2-7 July. Designer: Emma Reed, Reed Studio. Emma is a chartered landscape architect with 10 years’ experience in the industry. This is her first Hampton Court show garden. Children with Cancer UK is the leading national children’s charity dedicated to research into cancer in children and young people. Inaugurated in 1988 by Diana, Princess of Wales, in memory of Jean and Paul O’Gorman our aim is to improve survival rates and quality of survival in young cancer patients and to help research ways of reducing cancer incidence. Last year Children with Cancer UK invested £5.9m in new research across a full range of childhood cancers. We currently have more than 60 projects under way at leading centres around the UK. With over 90 characters, the Mr Men and Little Misses have brought fun and laughter to generations of families for over 45 years. Currently one Mr. Men and Little Miss book is sold every 2.5 seconds worldwide, and lifetime sales total 250 million books.